This is a really well engineered piece of equipment. Versatile with thoughtful design. If I had to be really picky, I would prefer flip up lens covers instead of the connected rubber covers. They are designed to quickly pull down and rest around the sight base however so they don’t get lost. I have to somehow convince her that we need one of these more than we need to do other things – like feed the kids or make car payments. We met Kristi, Aimpoint’s Marketing Director, at this year’s POMA Conference Media Day at the Range in Ogden, Utah and had the opportunity to try the Micro H-1 Red Dot sight. We were impressed with the size, weight, and clarity of the H-1 and worked out a more in-depth evaluation opportunity. The H-1 seemed like a great option for an AR platform so we planned an in-depth test on a DPMS Panther A3 Lite 16. The Micro H-1 and its slightly more tacticool sibling the Micro T-1 (night vision compatible) are, in fact, skinny. Just 1.6″ wide compared to the classic Aimpoint Comp M4’s 2.1″ width, the Micro H-1 (not counting the brightness adjustment wheel) was skinnier than the DPMS receiver it was mounted on. The Micro H-1 has a lens diameter of just about 3/4″. Weight is also dramatically reduced over the Comp M4 unit. The Micro weighs in at 3oz while the Comp M4 weighs 9.3oz. As an additional comparison, the Eotech XPS2 weighs about 8oz, so the Aimpoint unit is light. Really light. As light as it is, the Micro H-1 feels substantial. Made of aluminum with an anodized semi-matte finish, both the sight and it’s base were rock solid. No feeling of cheapness here. It keeps going. And going. And going. At BUDS Training, prospective United States Navy Seals are tested and drilled to internalize attention to detail. Apparently someone at Aimpoint took this concept to heart. We found numerous examples of really thoughtful design and engineering with the Aimpoint Micro H-1. The Micro H-1 includes a multi-purpose tool that serves a variety of functions. One end has two nubs (our word) for adjusting the windage and elevation controls. The opposite end has a Torx bit sized to the base mounting bolts. The sides of the tool are wide, flat plastic blades sized to the battery cover. To top it off, the direction of rotation for right windage and upward elevation adjustments are imprinted on the multi-tool. This is a particularly helpful feature for those of us who tend to toss the instruction book. The tool also serves as a nearly lethal shuriken assuming one has the proper Shaolin training. 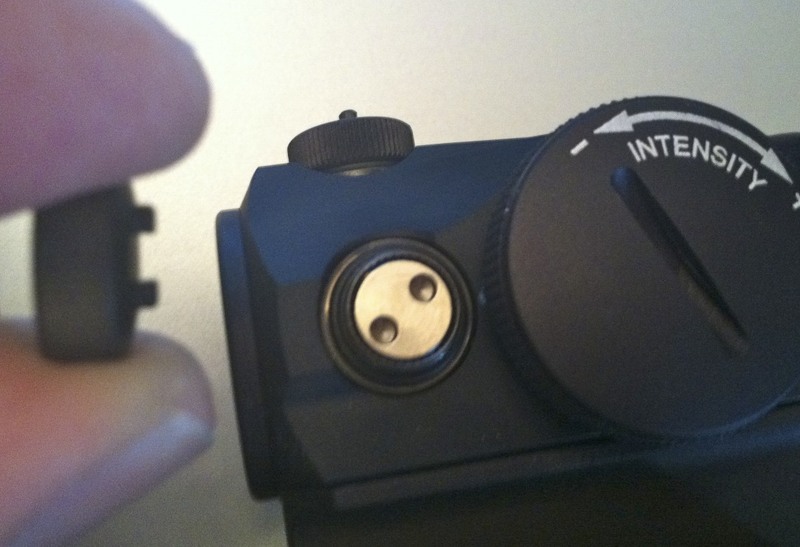 Another stand out feature is that the screw caps for the units windage and elevation adjustments are also shaped with nubs that allow the caps to be reversed and used as a tool to adjust the dials. So that neat nearly-ninja multi-tool is not technically required to be kept in the range bag. That’s just a nice touch. Our evaluation model came with a two part mounting system as it was to be used on a flat-top AR platform. First was the Micro LRP. This is a quick attach and detach system with a lever to clamp the unit on a Mil-Std Picatinny rail. 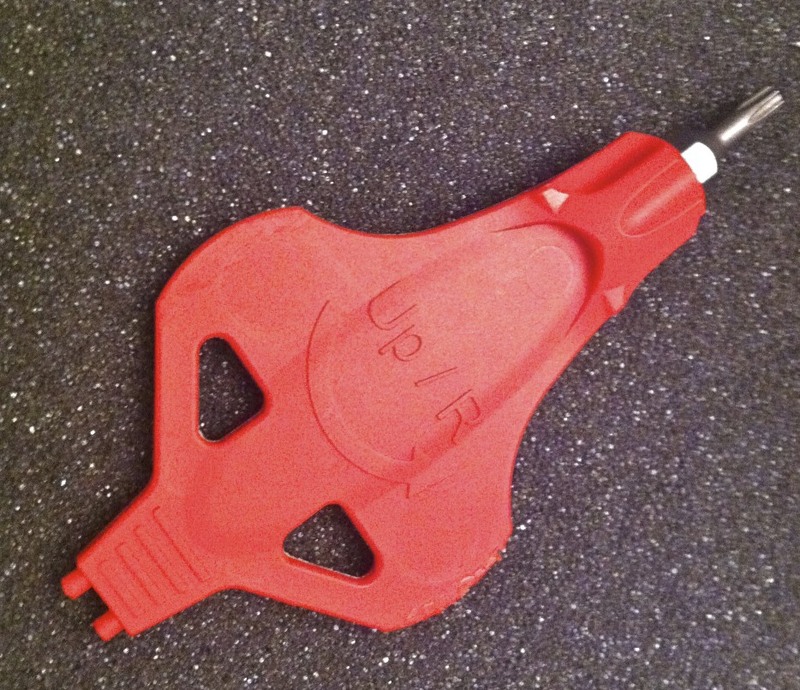 The spring loaded clamp lever includes a notch that locks the lever in place when tightened. It’s not going anywhere. The neat part of the system is that zero is maintained when the sight is removed and re-attached in the same place. Translation: You hit the same dang thing you aim at no matter how much you take the sight on and off. Our unit also included the Micro Spacer High mount which is attached between the Micro LRP mount and the Micro H-1 optic itself. This combination of components places the H-1 at perfect height for co-witnessing with iron sights on a flat top AR system. On our DPMS, a Magpul flip up rear sight and integral front sight lined up just below the vertical half-way mark through the Aimpoint optic. While we tested the Aimpoint Micro H-1 on an AR platform, it was designed with a multitude of uses in mind. Optional mounting accessories allow the H-1 to be used with 11mm dovetail systems, Glock pistols, Ruger 10/22’s, Ruger Mark III’s, bows, revolvers with Weaver mounts, and Merkel Double Rifles. Safari anyone? There was an additional benefit to the small tube of the H-1. It provided a reasonable ‘fast and close up‘ sighting method on its own, without need to pick up the red dot itself. 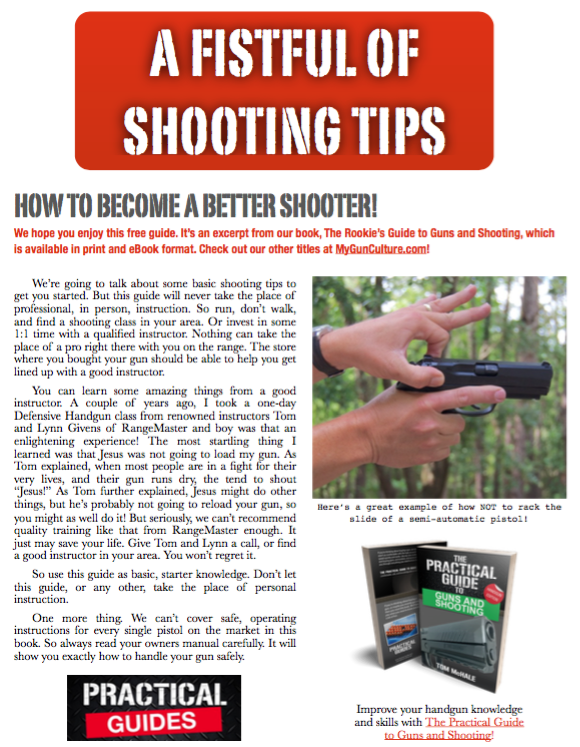 For short range shooting, the tube itself provided a decent ‘minute of evil d00d‘ sighting system. The Micro H-1 has a 4 MOA (minute of angle) dot size, so it’s designed for tactical, competitive speed shooting, or hunting applications. The unit has 12 degrees of brightness adjustment for a variety of lighting conditions. We found that settings 7 and below provided an exceptionally crisp sight picture while brighter settings were useful in heavy sunlight conditions. Because the specs said we could, we mounted the Micro H-1 and zeroed it at 50 yards, shot a bunch of stuff, then removed the optic and did some back up sight shooting. Remounting the Micro H-1 with the LRP quick mount system did in fact maintain the original zero. That’s a handy feature for folks like us that like to tinker with stuff, whether it needs tinkering or not. We were a little skeptical about two things with the Micro H-1. First was the small diameter of the optic. Would that slow down target acquisition? Second was the specific mounting system for a flat top AR being made of three distinct parts. Would it be solid? Both concerns turned out to be non-issues. Kind of like Justin Bieber becoming a threat in the world of Ultimate Fighting. Sighting with both eyes open was actually improved as it allowed better peripheral vision with the non-sighting eye. 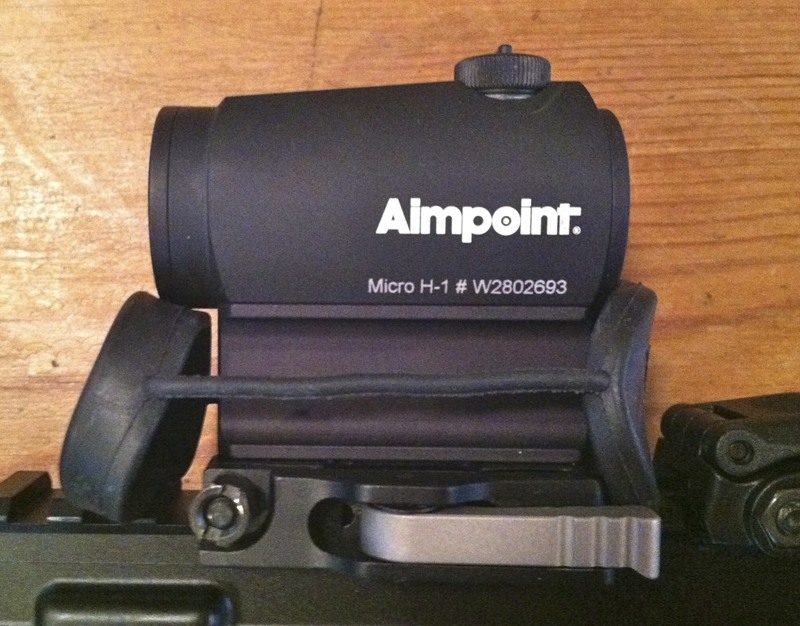 And the Aimpoint Micro H-1 was solid, well fitted, and well constructed. our test unit came with the sight, spacer, and LRP mount pre-assembled, and one wouldn’t know that they were three separate pieces without reading the documentation. Four Nuns on this one – it’s a really impressive optic. Did you see Larry Vicker’s torture test on a Daniel Defense carbine? The true star of that test was the Aimpoint. As a result, I sold my bulky Aimpoint CompM4 and bought a Micro.